If chances are that one has used a bandage to cover a wound, treated an infection by consuming antibiotics, or used natural gas for heating the home, then possibilities are that various advancements in the field of research in nanotechnology at Colorado State University (CSU) might be advantageous. Vivian Li, assistant professor in the Department of Design and Merchandising, has various research works related to nanotechnology and fiber science. Li also handles classes in the subject of textile science, a significant component of the apparel and merchandising major in the department. At the time when Li started graduate school at Cornell University, she collaborated with a professor there, working on fiber science analysis. Within a short time, fiber science turned out to be Li’s drive and main interest for accomplishing her PhD. Li started analyzing the way fiber was lubricated in the course of the spinning process. She aspired to have an in-depth knowledge of the functioning of the material at the molecular level and the actual role of the lubrication process as a protection layer. It was her first insight into the functioning of fiber science at the nano-scale. The Department of Design and Merchandising refurbished a new laboratory for Li to carry out her nanotechnology research. The additional space enables her to effectively and efficiently investigate materials with nanostructures. Nanoparticles are exceptionally smaller particles with a size of 1-100 nm, where 1 nm is equal to one-billionth of 1 m. Investigation of the nanoparticles mandates the use of special equipment. After the allocation of the additional space, at present, Li has been using a new microscope, the atomic force microscope (AFM), which will simplify the process of gaining an in-depth knowledge on these nanoparticles. The new microscope enables Li to observe a 3D virtual model of the particle created by her in the lab, allowing her to have a deep look at the functioning of the particle. Other departments — such as Biology, Mechanical Engineering, Chemistry, Chemical Engineering and Biomedical Engineering — are also using the AFM for the analysis of organic and inorganic materials. After accomplishing her PhD in the field of fiber science in the year 2009, Li worked in the Department of Earth and Atmospheric Science at Cornell University, where she began the nanoparticle tracer study. In 2013, after she joined CSU, she went on to create and investigate the nanoparticles in collaboration with William Sanford, CSU faculty member in the Department of Geosciences. The main goal of the project is to create nanoparticles that can be administered into the subsurface of oil reservoirs to search for the presence of oils. This enables highly efficient extraction of oil and gas. By using the existing tracing techniques, the oil and gas industry has been extracting only a meager percentage of oil and gas that actually exists. Currently, the average production for gas and oil industry is 30 to 50 percent of the product. This means that 50 to 70 percent is left underground. The process developed by Li is reasonably inexpensive and can enable industries to trace particles by eliminating false indicators. In contrast to chemical tracers that might get trapped in the subsurface a portion of them get scattered into minute cracks through which fluid cannot pass through, the fluorescent carbon nanoparticles can be traced very easily. As the nanoparticles continue to stay in the fluid flow, they can precisely track oil as they can trace the flow in the subsurface. As Li has developed her nanoparticle at present, she and Sanford, her colleague, are looking to find more chances to perform field tests to see the actual behavior of the nanoparticles in the field. After investigations and improvisation, the nanoparticles will be rendered obtainable and accessible to the industry. The focus on textile science has made way for wider applications of nanotechnology, for instance, in the medical field. Li has been collaborating with two other scientists from the Departments of Chemistry and Microbiology at CSU to develop nanofibers that can be integrated into a dressing or bandage. By carrying out a long procedure of lab composition, Li has developed and investigated nanofibers that show if a bacterial infection is developed in a wound. As the size of the nanofibers is less than 100 nm, the nanotechnology has the ability to precisely ascertain the location of bacterial infection. Initially, the fibers are blue in color and transform into pink or red color on the presence of bacteria. The early visual observation can come in handy in various disparate applications. Citing a source of information, nearly 90,000 people die every year due to an infection contracted in a health-care facility or hospital. The use of this nanotechnology can allow very quick recognition of bacterial infections, enabling patients to be treated immediately. Identification of the presence of a bacterial infection can also assist doctors in becoming aware of the need for antibiotics and preventing overprescribing, which culminates in antibiotic-resistant infections. 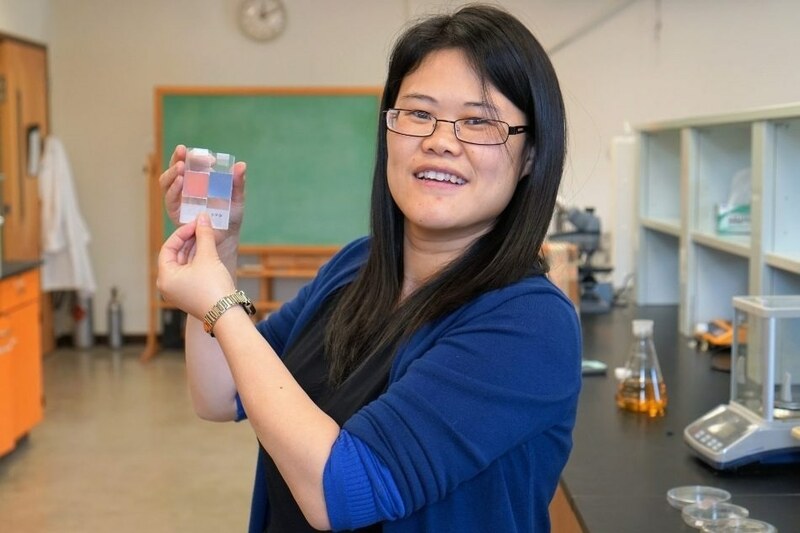 Although Li is yet to gain in-depth knowledge of the scientific aspects of the way the bacteria set off the change in color, she has the knowledge of altering the size of the nanofibers for precise detection of the bacteria. She also has knowledge of the mechanism of the color change. I think it’s very important for scientists to know and understand the actual application of nanofibers so we can find out what is happening when the color changes. This can help us modify and test the nanofibers more efficiently. Once we learn that, we can help make the fiber relevant for many different applications. This can transform one feature of the health-care industry and might prove beneficial for factions such as nursing homes, senior living communities, the military and many other fields that are plagued by bacterial infections. Li is also analyzing various other research advancements by adopting nanotechnology and fiber science, and she is confident that this will play an important role in enhancing the efficiency of the nanostructured materials. Concepts such as an all-in-one solution for bacterial infection or various other uses of nanofibers in a restaurant for eliminating microbial contamination have been taken into account and investigated in her lab. There is a constant need to upgrade the functions and performance of textiles for the improvement of human living, protection and well-being. My research is aimed at addressing this need by focusing on the development of multifunctional textile materials through the application of nanotechnology. Advances in nanotechnology provide unprecedented opportunities in the textile industry for improving performance and creating new functionalities.